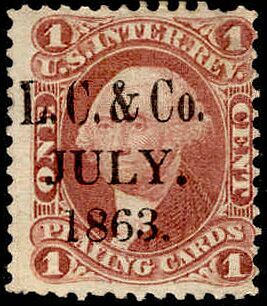 The two-cent Lawrence and Cohen stamp was issued from May of 1865 through July of 1866. A total of 1,149,750 were issued, all on old paper. 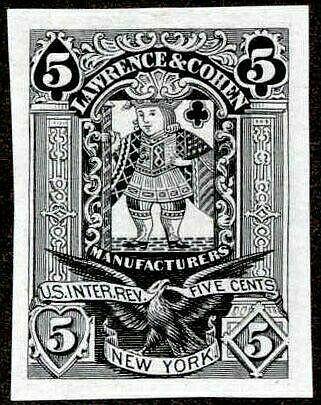 From August 1, 1866 to July 1, 1883 the tax on each pack of 52 cards was five cents. 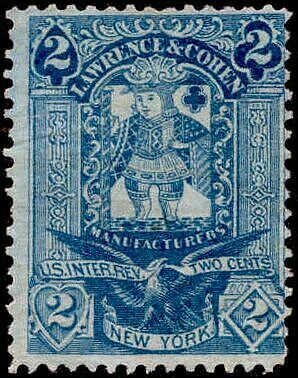 The five-cent Lawrence and Cohen stamp was issued from May of 1865 through March of 1874. A total of 5,500,408 were issued on old paper, and 2,616,192 on silk paper. The one above was printed on old paper. 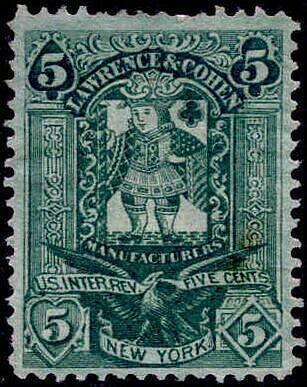 A trial color proof of the five-cent stamp on India paper. 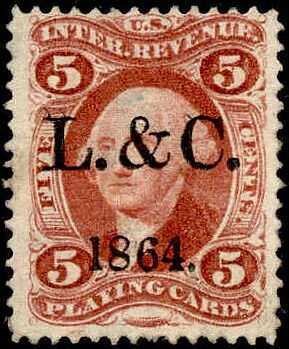 Lawrence and Cohen used First Issue playing card stamps prior to August of 1864. At that time the tax was one cent per pack up to 18 cents in cost, two cents to 25 cents, three to 30, four to 36 and five cents over 36 cents in cost. After August five cents would have been useful only in multiples until that became the rate per pack in August of 1866. The copy above was probably used in early 1864.